The St. Clair West polyglot is the high dive jumper of linguistics who hurdles off the platform twisting and turning words and phrases and then, seconds later, lands with a splash-less toe point, a sentence full of flavour. The St. Clair West polyglot’s language is not the international Esperanto, a made-up language no one ever hears on the street. Instead, it’s a made-up neighbourhood language that people actually speak. 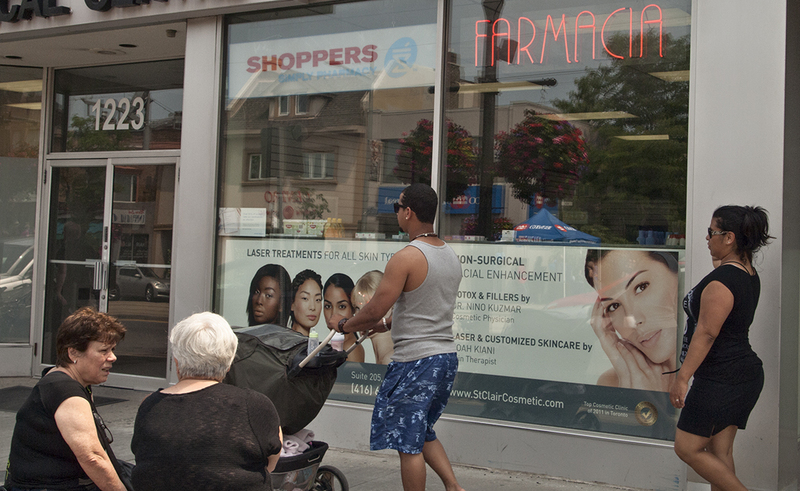 What does it take to achieve the verbal agility and nonchalance of the St. Clair West polyglot? A desire to communicate and a creative predisposition. More practically, you have to be blasé about conjugating verbs, especially ‘to be’ and ‘to have’, and you have to be fearless and even quirkily whimsical about adding vowels to the end of a noun or adjective. Paying attention to the context and the tone and flow of the spoken word will help you guess at the meaning of a sentence. As St. Clair West polyglots talk and listen, they create their language, because there is no way of knowing what combination of words will be used. Here’s how two St. Clair West polyglots sounded when they got together over dessert. One is a first generation Italian-Canadian who studied Spanish (FICS). The other is a second-generation mixed Irish/Kurd Canadian who studied French in grade school (SIKF). While we were digging into some fruit salad, SIKF, who worked at La Paloma Gelateria on St. Clair, said a word in Portuguese. It’s helpful to take a page from Toronto’s earlier polyglot groups such as Jews, Italians, and Jamaicans whose communication aplomb you can check out here. 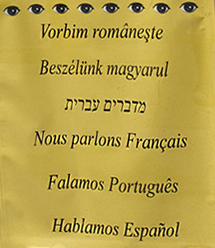 Yiddish, spoken by Ashkenazi Jews, is a combination of a Germanic dialect, Hebrew, and other modern languages. If you’re a language klutz but you want to schmooze or kibbutz, think of the Yiddish flȃneur on St. Clair West and show some hutzpa; nosh on a few words from other cultures. My polyglot savoir faire is tied to the Italian community which created a hybrid language called Italiese from two wholly different sounding languages – English and Italian. It transforms English words into a mix of English and Italian, or more accurately, into English and various Italian dialects. For example, job becomes jobba, car becomes carro, store, storo; subway, subwaya; cake, checca (pronounced kaykaa), and of course mangia-cake, a delightful combination word which describes an Anglo Canadian as a cake-eater. You can see the potential for creative linguistics the new St.Clair West polyglot has by taking a closer look at mangia-cake. The mangia-cake, Italian-Canadians observed, ate dessert every night after dinner, something Italian immigrants didn’t do. They reserved their sweets, usually cookies and pastries, like biscotti and cannoli, for special occasions and celebrations. Younger generations have transformed the term mangia-cake into ‘caker’ to describe a person who is of Anglo origin and/or middle class origin and does not identify with an ethnic group or community. My mother introduced me to the polyglot world when I was a baby. Her family had emigrated from Italy to Alsace Lorraine in France after WWI. She speaks French (her first language), Italian (her second language, with a French accent); English, with a German accent, because she was forced to learn the language in occupied Alsace Lorraine, and she speaks Friulan, a language spoken in northeastern Italy which she learned when her family briefly moved back to Italy after WWII. In Toronto, my mother sang to me in French and read instruction manuals in French; she spoke Friulan within the family, and chatted with her neighbours in Italian and Italiese. Later, while she was still learning English, whenever we watched movies together, I had to translate dialogue for her from English into Friulan. “What did he say? What did he say?” she would ask when Agatha Christie’s Hercule Poirot was about to reveal the murderer on the Orient Express. Until research at OISE in the 1970s, and Jim Cummins’ work on language acquisition proved otherwise, it was thought that my multilingual mother was ruining my brain. The experts believed that introducing children to more than one language was detrimental to their intellectual growth. Instead, with so many bilingual immigrant children living in the city, the research was able to demonstrate that multilingual children can easily learn and transfer knowledge from one language to another. A recent study by researchers at Duke University in Durham, NC, and Massachusetts Institute of Technology in Cambridge reveals how a baby’s brain learns language. Scientists measured the activity of neurons in a baby’s brain by playing sound clips while scanning the brain in a functional magnetic resonance imaging (fMRI) machine. Babies pay attention to sound groupings, milliseconds long, and the timing of speech – the rhythm of language. The researchers call them speech quilts. The experiment showed that a baby’s brain can differentiate between random sounds and language sounds and store the information in the superior temporal sulcus (STS). The baby brain looks for speech patterns and then learns them. I was learning four different words for everything. Turns out my mother was cuddling my brain in speech quilts and preparing me for encounters with future St. Clair West polyglots. 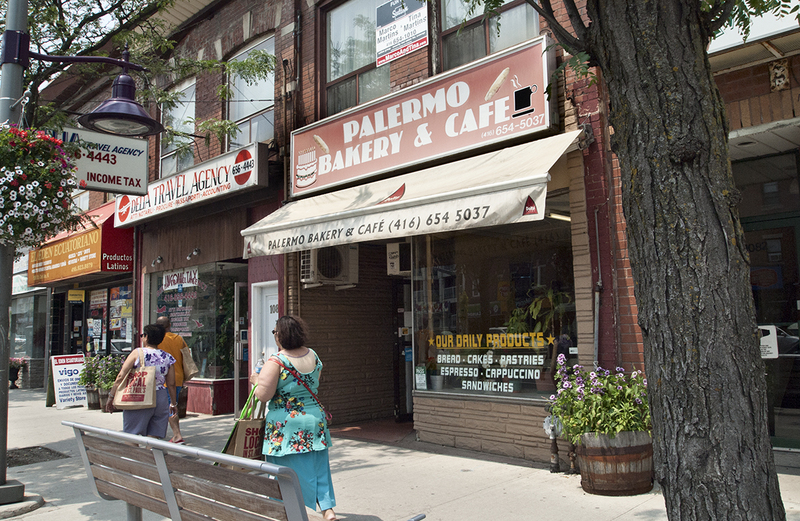 Today, Portuguese and Spanish are trending on St. Clair West. For years, Italians and Portuguese have lived next door to each other and worked together so they tuned into each other’s languages sem problemas. Plenty of Italians who had originally immigrated to Brazil, Venezuela, and Argentina are now here, together with other Spanish speakers from Central and South America. In this multilingual mix, St. Clair West polyglots stand out because they shift from one language to another, borrowing words, changing them, changing meanings, and ignoring grammar rules altogether, to talk to people outside their own culture. To Torontonians who fret over getting their kids into French Immersion or to people concerned about disappearing languages as globalization and late capitalism takes business English around the world, St. Clair West polyglots say, hey, hakuna matata, because they know language is a lived experience, and communication is human nature. This is how I talk to some of my neighbours–I Portugueseify my French and Italian.